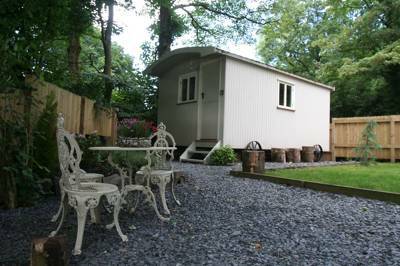 This cosy shepherd’s hut close to Windermere in Cumbria has all mod cons in miniature. This four-berth hut is fully insulated with sheep's wool. Inside, the huts feature quality fitted kitchens with fridge, oven, hobs, sink and all the utensils and crockery, an en suite bathroom, underfloor heating, BOSE sound, TV/DVD, bedding and linen. The huts are also accompanied by an arctic cabin where guests can congregate and cook their dinner/hang out around a real fire. This comes with sheepskin rugs and throws. Plenty of parking space and private, gated access. In the small village of Haverthwaite, where trains whistle to a halt outside the quaint old station, Woodmans Shepherds Huts is a glamping site lucky enough to enjoy the same quintessentially English setting. Ensconced in their own private woodland enclave, the site is made up of just two wooden shepherd’s huts, insulated with sheep’s wool and furnished inside to a seriously comfortable standard. Woodman’s Huts are located not only in a beautiful Lake District location, only three miles from Lake Windermere, but we also boast another accolade – “Foodie Heaven “. The renowned 12th century village of Cartmel is just 6 miles from us, where the world famous Cartmel Sticky Toffee Pudding is made. It is also home of the renowned 2-starred Michelin Star restaurant Le’Clume, where the rich and famous fly in by helicopter to enjoy their extravaganza delights. Cartmel is not only famous for its beauty, a wonderful 12 century Priory, food and location but it boasts another accolade – it’s reputed to be the “Country’s Prettiest Race Course“ where it holds several horse racing meetings throughout the year, a “must do“ for anyone’s bucket list! Ulverston is our pretty market town, with its cobbled streets, its just a ten minute drive away, where you will find lots of local bespoke individual shops and award winning restaurants, artisan tea rooms, and gin bars. It’s also the birth place of Stan Laurel, so a visit to The Laurel and Hardy Museum should be on your list of 'to do' list during your stay. And last but certainly not least is the fabulous “Drunken Duck”, just 20 minutes up the road, voted the best “Pub Restaurant 2019”. You will not only be served the most amazing food, but it has its own micro brewery producing some seriously good beers. The views from its front door are jaw dropping, and add to its perfection. Our little piece of heaven offers you everything you would want. You will experience staying in our lovely bespoke hand built huts, where you will enjoy glamping at its very best. Crisp white sheets, fluffy towels, underfloor heating and open fire, what’s not to like?! It’s five star quality without paying five star prices ! Huts are fully insulated with sheep's wool. Inside, the huts feature quality fitted kitchens with fridge, oven, hobs, sink and all the utensils and crockery, an en suite bathroom, underfloor heating, BOSE sound, TV/DVD, bedding and linen. The huts are also accompanied by an arctic cabin where guests can congregate and cook their dinner/hang out around a real fire. This comes with sheepskin rugs and throws. Plenty of parking space and private, gated access. It's a 15 minute walk to Haverthwaite Railway Station (015395 31594) where you can hop on a steam train and chug your way to Lakeside (via Newby Bridge) and then, if you want, continue the journey by water on one of the Steamers of Windermere Lake Cruises (015394 43360). The cruises cover the entire lake (the longest in England) from top to bottom. Alternatively Windermere town is just 15 minutes in the car. The ancient village of Cartmel is famous for the 12th Century Cartmel Priory, and is well worth a visit. The village also houses a variety of interesting shops and traditional pubs around its main square and is home of the world famous 'Cartmel Sticky Toffee Pudding!' The campsite is also conveniently located 15 minutes from Grizedale Forest (03000 674495), with miles of good cycling, walking and hiking trails. Right outside the huts there is also a series of excellent trails, known as Haverthwaite heights. This allows you a quick ascent to the beautiful views of Morecambe Bay (01524 582808) or in the other direction, the charming Rusland Valley and Coniston old man. Plenty of good pubs within a few miles – though the kitchen in the huts means you may just want to stay in! After a day in the lakes you can enjoy a hearty meal at the The White Hart (01229 861229; 1 mile) in Bouth, which also offers beautiful woodland views. The pub's horseshoe-shaped bar boasts 6 well kept cask conditioned real ales and 3 changing guest beers from around the UK. Also in Bouth, Old Hall Farm (01229 861993) has a lovely tea room offer coffees, cakes, lunches and their famous cream tea. The fabulous Drunken Duck Inn (015394 36347), in Barngates at the north of Lake Winderemere (20 minutes by car), is worth the extra distance. It won the Best Pub Restaurant Award 2019 and not only has excellent food but also its own micro brewery producing some seriously good beers. The views from its front door really seal the deal. The nearest sizeable town (6 miles away) is charming Ulverston, with beautiful cobbled streets and a market twice a week. There is also supermarket and plenty of small independent eateries and shops. The site is just off the A590. 15 minutes from Junction 36 of the M6. If you are using a SAT NAV use postcode LA12 8AB. The main bus route to Kendal and Barrow has a stop just 2 minute's walk down the road. It is a 15 minute walk to the steam railway (015395 31594), which takes you to Lakeside and then take Windermere Steamers onwards to Bowness and Ambleside. 2 handmade, cosy shepherds huts in the beautiful Lake District National Park.